00:20:00 Makes 10 servings, 1/2 cup (125 mL) each. This seasonal side dish features summer's bounty at its best. 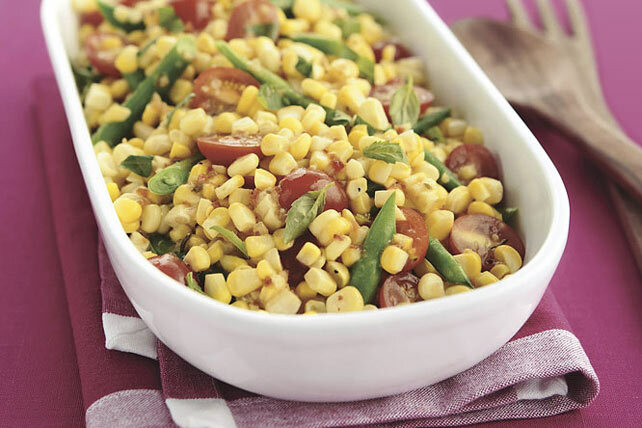 Made with fresh corn, green beans, tomatoes and a sprinkling of basil, this veggie salad is bursting with flavour. Mix dressing and mustard in medium bowl until well blended. Cut off kernels from ears of corn. Add to dressing mixture with remaining ingredients; mix well. Fresh ears of corn should have bright green, snugly fitting husks and golden brown silk. For best results, cook and serve the day of purchase. Cut off the tips of the ears to flatten the ends. Stand the ears upright on the flat ends. Using a very sharp knife, cut downward, removing 3 or 4 rows of kernels at a time. The corn, beans and tomatoes can be combined ahead of time. Refrigerate up to 24 hours before tossing with basil and dressing mixture just before serving. To grill the corn, carefully pull back the husks from the tops of the ears to remove the silk, being careful not to detach the husks from the bottoms of the ears. Rinse corn. Rewrap husks around corn. Place corn on grate of barbecue over low heat. Grill 15 to 20 min. or until tender, turning frequently to prevent the husks from burning. Remove corn from barbecue. Using a towel or oven mitt to protect your hands, peel back the husks and cut off the kernels. This great-tasting vegetable salad can be part of a healthful eating plan. Serving Size Makes 10 servings, 1/2 cup (125 mL) each.